Simple, continuous sports action – When it comes to simplifying the game, SFG Soccer did a great job focusing on the core mechanics of soccer. You’ll be able to play through an entire game without so much as a single stoppage. No cards, No tripping penalties, no throw-ins. It isn’t even possible to have the ball leave the field of play. The goal is built into the stadium wall, so if you miss your shot left or right, the ball will simply bounce off the wall. Kicked it into the stands? No problem, it’ll bounce back into play. 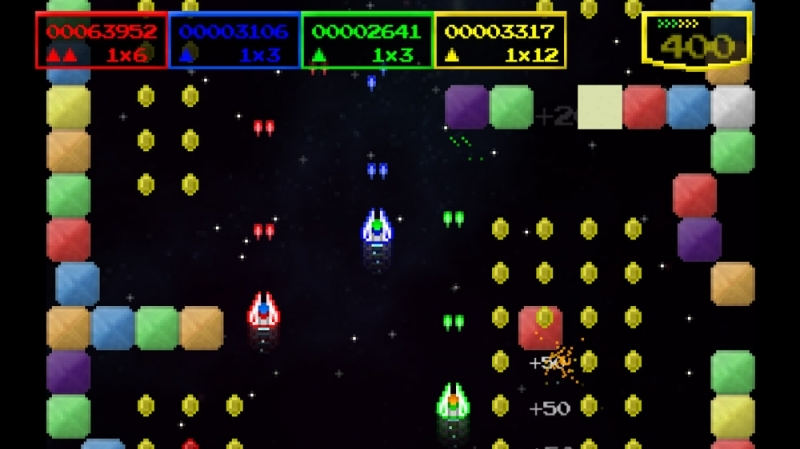 Variety of modes – It is always nice to see an indie title with a solid offering of features. SFG Soccer offers a Practice mode to help hone your skills, an Exhibition mode to play a quick game, and a fully realized Career mode. In Career, you can take your team through a season and you’ll be able to improve the statistics of your players. You don’t have to manage your statistics, though. Players can also have the game upgrade your player stats automatically. On top of all the modes, there are also a number of different camera angles gameplay settings, and ways to personalize the controls to tweak your preferences. It’s not pretty – Stir Fry Games has incorporated the Xbox Live avatars into their other titles. It could be assumed that this title must have been released prior to the avatars, but alas, it was not. The game looks awful. 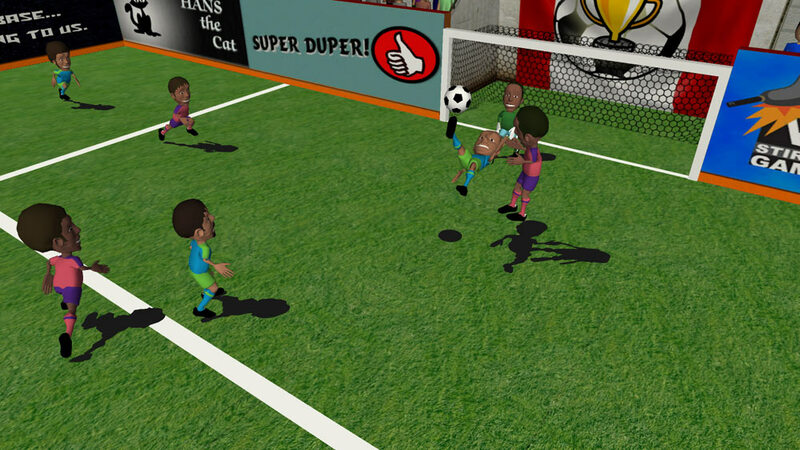 We may seem like graphic snobs but this game looks like plastic melting in the microwave. While we don’t know the extent control indie games have over avatars we’d hoped they would have been used instead. Are there rules? – There are no out of bounds, and the goals are built into the wall. There are no penalties and no way to trip the opponent. Without offsides, it is a cherry-pickers dream game. 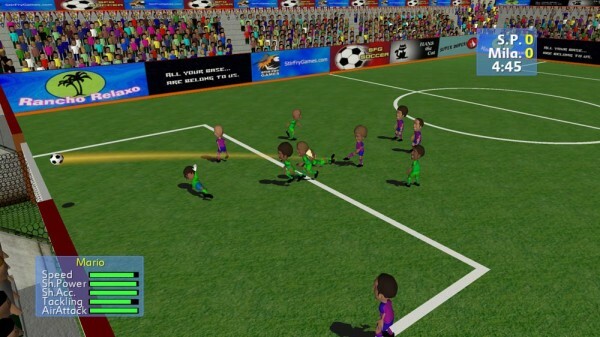 Also, by removing the penalties and out of bounds, Stir Fry removed the strategy of soccer. When games make that kind of design choice, it is usually to focus on great gameplay, like NBA Jam or Blitz. SFG Soccer didn’t end up offering that sort of fun gaming experience. 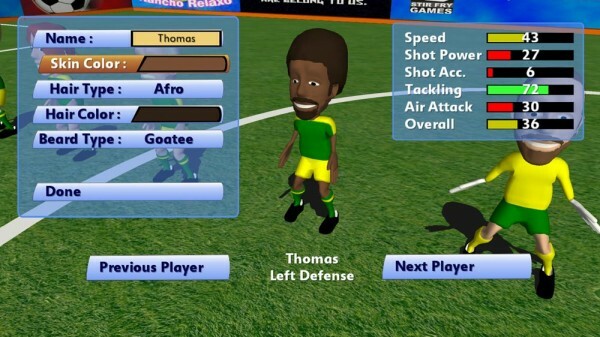 It’s far from the prettiest game and even though it’s approachable, SFG Soccer takes out all of the unique features that make up a soccer game. There are a variety of options and choices to playing this game, but the title suffers from Stir Fry’s focus on simplicity on the field. They seemed to have focused on offering a variety of modes and camera angles to help the player find their preference, but it was the gameplay itself that failed to interest us. Unfortunately, though SFG Soccer has a solid amount of game modes and play styles, it does not deliver a solid soccer game, especially for 400 Microsoft Points.